Friday, Mar. 23, 1888 some colder again, & blustering with snow in air most of day. Much as usual with our folks, should think, with of course enough to keep them busy, & Boys shut indoors most of time, tho' Clyde is now quite a help at errands. As well self & spending day in chamber much as usual after doing small ironing first of A.M. Saturday 24 About as cold, but pleasant with less wind. 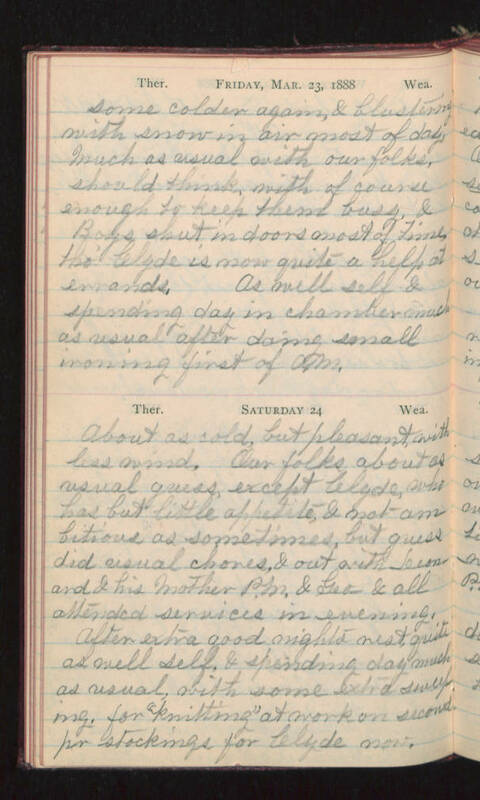 Our folks about as usual guess, except Clyde, who has but little appetite, & not ambitious as sometimes, but guess did usual chores, & out with Leonard & his Mother P.M. & Geo & all attended services in evening. After extra good nights rest, quite as well self, & spending day much as usual, with some extra sweeping, for "knitting" at work on second pr stockings for Clyde now.